Swim backstroke the “WEST” way! Learn to swim backstroke with the “West” technique. Swim faster, looser and healthier. Experience the benifits of the “WEST” swimming technique and learn why it’s the healthiest swimming technique in the world. In this course you’ll learn how to swim 200m backstroke whilst improving your swimming technique, toning your muscles and most importantly – learning how to protect your lower back and neck whilst swimming. Have you heard that Backstroke is the healthiest swimming technique and therefore tried to imitate Olympic swimmers? The WEST swimming technique’s backstroke is actually a far better swimming technique for swimmers over the age of 21! 70% of the people around the world over the age of 21 suffer from lower back pain. When we swim the “normal” backstroke we create an arch on our body which often causes to add stress to your lower back, shoulders and neck. This is why we strongly believe that swimmers must learn and adapt to the WEST technique in order to prevent such pains or injuries. The course is based on 4 different training workouts for you to perform. Each workout session has 1-10 videos which will help you understand the training drills and stretches you need to do. For each session you’ll also receive detailed pictures thoroughly explaining each drill and helping you to remember how to do them correctly when in the pool! We’ll guide you step by step until your master your 200 m backstroke with the West technique. You must be able to swim 25 m underwater. You’ll need rubber and elastic fins to help you train. The course is built up of over 38 lectures & 57 mins of online video content! Anyone who wants to learn how to swim backstroke, improve their backstroke swimming technique, learn how to swim in a way that will protect their lower back. The course is especially recommended to people suffering from lower back pains. 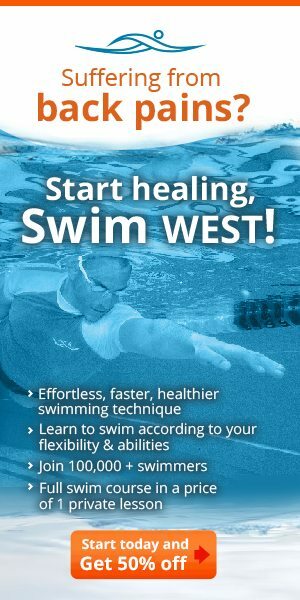 Take this course and learn why WEST swimming is the healthiest swimming technique. Many Doctors tell you to learn to swim backstroke because it it healthy, Is it? Some time when we sink in backstroke we create an arch to our lower back, this exercise will let you understand why is in so important to swim backstroke in WEST swimming technique.